In which I get shinies and film them! In any case, last night I got shinies in the mail as well as at work so I decided to show them off. Enjoy! And if you can, please view directly on Youtube. They apparently have a setting where embedded views do not count in the overall tally. I came home this afternoon from a wonderful time at the movies to find this package of beauty in my mail. The scent of resin still clings to the pages. 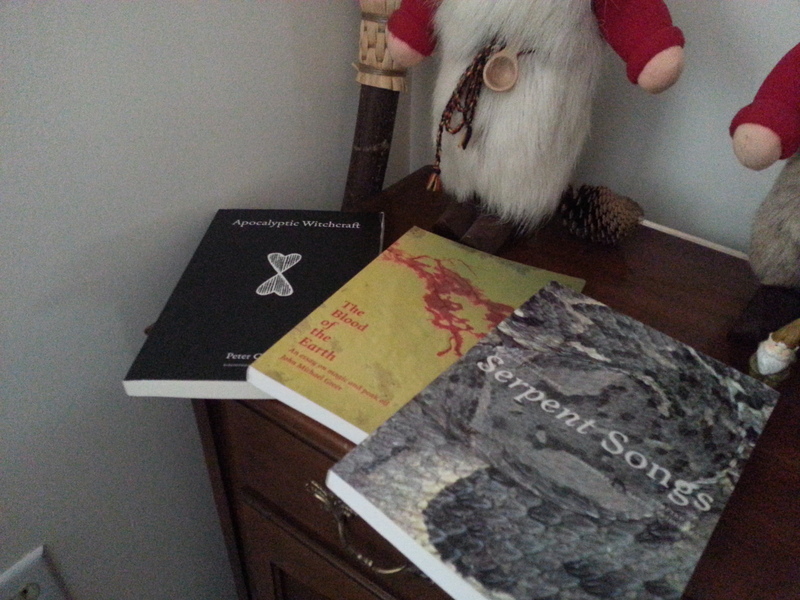 From left to right: Apocalyptic Witchcraft, The Blood of the Earth, and Serpent Songs. I think I’m a little horny. I had hoped to put this post up a week ago but that was not to be. I’m still trying to find my groove, but continue to get bogged down in the daily necessities. Meditation never happens, belly dance practice rarely happens aside from formal class time, my physical living area is packed with stuff I need to sort through… it’s disheartening. I want it not to be this way, but I can’t seem to find a way to change things. At least I got to go to New York Comicon along with The Stone to see my beloved Secret Chiefs 3 and related people last week. My ka was more than fed. It gorged. It was worth it. So while I try to find some real balance and keep practices and activities I enjoy in my life, here’s some reading to share. I put up a new post on Pagan Activist earlier in the month on why research and asking questions is a good thing. The joy of synchronicity turned up TWO posts in my blog reader around the same time covering the subject of hearing the Gods and how to determine if the communication is legitimate. First one is from WaneWyrds and the second is from Devo at The Twisted Rope. For the month of October you can download a FREE pdf copy of the antheology Hoofprints in the Wildwood, for the Horned Lord. My friend Solo was in an accident recently and is selling some nice stuff in his Etsy store to help cover medical costs. A recent blog and tradition discover has been Tess Dawson, who heads a group of Canaanite reconsctructionist pagans. She is also blogging over at the PaganSquare section of Witches and Pagans, and did an excellent post about when ancestors don’t match your religion. This is the best writing I’ve seen about why looking to what your forebearers did before Christianity isn’t always the best solution. My friend Starwalker is participating in, oh, whatever the acronym is for this month, which is blogging daily in October a la National Novel Writing Month. And one more post from Devo, who is great at being involved and active in community. To me, she is a stellar example of how to be an active remetj in the House of Netjer. I love her suggestions for how to build community among polytheists. Fields is having a sale! One of my favorite things to do when at Pantheacon and/or in San Francisco is pay a visit to Fields Bookstore, or their booth at the con. I can and have spent into the triple digits on books from them, and have zero regrets about spending that much money. If you are in the market for some new books, check out the sale they have going until 8 July! “Today through Sunday, we’ll be offering 20% off all in-print Llewellyn titles, both in-stock and out of stock, in the store and on the web. * The sale price will not be shown in your shopping cart, but will be applied when we actually charge the order. * If there is a Llewellyn title you’d like that you don’t see on our web site, give us a call or send us an email. We’ll be happy to apply the discount to those as well. The sales does not apply to Not-Yet-Printed titles. * The sale applies to all Lo Scarabeo tarot decks, bags, etc. that we stock or can re-stock. You can view the list of Llewellyn titles here. Today (at least) on Amazon, there is a title available for free on the Kindle which looks very promising. Northern Plant Lore: a field guide to the ancestral use of plants in northern Europe. Have any of you read this? Or are you familiar with the author? A quick search does show he’s a member of AFA*. Maybe someday I’ll get a chance to read this. In the meantime, grab while you can! *Asatru Folk Assembly, which tends to be more on the conservative and folkish side. Circle of Stones has been re-released! My friend Erynn has just announced that her book of Celtic meditations, A Circle of Stones, has now been rereleased by Immanion/Megalithica Press and is available for order! Sarah Kate/Dver of the blog A Forest Door has a new collection of essays out. Dewlling on the Threshold: reflections of a spirit worker and devotional polytheist. First, a shout out for an older book which definitely should be read by more people. 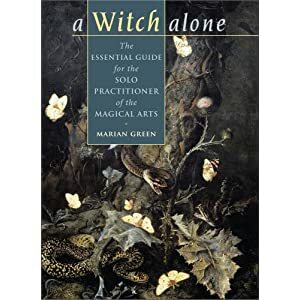 A Witch Alone by Marian Green. 13 chapters, with tasks for each moon cycle of a year, meant to bring the student more into alignment with a path focusing more on the natural world around them. She places a high emphasis on meditation, visualization, GOING OUTSIDE, and working with tools and materials you find while out there, as opposed to constantly dropping money on stuff stocked at your local (or online) woo-woo retailer. Especially recommended for people who want to take on a more European style practice, since Green is very in tune with her native England. In publishing news, Huginn has put out a call for submissions for issue 2.2, covering ethics and values. And now for some other material to read or listen to. The Wild Hunt now has a podcast! Kudos to Jason for already getting some great material recorded. Issue ten of Hex Magazine is in the pipeline and should be getting mailed soon. I always look forward to seeing what has been collected in each issue. There is always a great mix of both scholarly and experiential pieces presented. Thorn Coyle has a new ebook available based on her Crafting a Daily Practice online course. You can read the introduction online for free, which is all I have gotten so far. Reverend Tamara Suida, aka Hemet and Hekatawy I, did a podcast earlier this year about Kemetic Orthodoxy. If you’re curious to know about the religion, or have only heard second-. third-. or fourth-hand information, give a listen. My dear friend Sufenas has announced their own study course, Academia Antinoi! The courses cover a wide range of topics: queer spirituality, reconstructionism, Antinoan related spirituality, and some topics on Celtic recon spirituality. I can’t wait to see how the academia develops in the coming months. How can you resist a free collection of old witchcraft related books scanned and hosted by Cornell University? Where is my free time so I can dig through the offerings? In an effort to connect with more practitioners, I’ve been dropping a lot of blogs into my reader and trying to comment more. The blogroll needs to be updated to reflect this, but in the meantime sate your curiosity here. If you’re involved in any sort of witchcraft and not reading the Witch of Forest Grove, you are missing out on some amazing spiritual and practical writings. Sarah knows what she is doing, is not overrun with ego, and I always love seeing how people’s spiritualities impact their day to day life. I’ve become a fan of Ms Graveyard Dirt since finding her as a suggested follow on Twitter. Not linking her web site because I know she’s had trouble with it being hacked. In the meantime, go read her tumblr. And several more of varying stripes. Check them out! Some of them I found because I was specifically looking for people talking abut the hedge in the Pagan Blog Project. The Norse Mythology Site HIGHLY RECOMMENDED! Or, I get to merge my professional and spiritual lives for the sake of blogging! Source used under Creative Commons license. At the start of the calendar year there was something of a dust-up over on Tumblr after someone posted a .pdf file containing the text of about 300 books. Among those books were several titles which are still under copyright. The discussion of copyright infringement sparked a lot of conversation, including from one of the publishers whose work was included in the file. If you missed those posts last month, I encourage you to read them now. 1. Posting of books in an unauthorized electronic format is ILLEGAL. Plain and simple. Unless the author explicitly states otherwise, written material is automatically under copyright. Incidentally, this also applies to material posted to the internet. 2. It’s unethical. How is it unethical? Let me count the ways. *It’s infringing on the author’s right to make a living. Most pagan/polytheist/magical authors do not make a large amount of money on their writing. By posting their books in this format, you cut in to their livelihoods. *For those who follow a “harm none” philosophy, I refer to the point above. Again, these authors aren’t rolling in dough from their writings. These sort of files can cut in to money they NEED just to keep their lives going. If your spiritual path includes dictates relating to honor, I would find it hard to think a person doing such things in honorable. I’ve also regularly seen full text of articles wind up on Tumblr without permission of the author. Yes this does qualify under the same rules of copyright. Besides, there are enough authors who have some of their work online which they chose to release. Support that. You’re not doing much to show authors that you like their works if you’re only reading pirated versions of their works. But some issues also do come up with this discussion. I can’t afford all these books! This one is a fair statement. The economy is still in a slump, no matter what some pundits may try to say. Paganisms aren’t all about reading, they’re about doing and experiencing. There are a free resources you can check out, like Sacred Texts, Project Guetenberg, and more specific sites like Northvegr for Norse/Germanic mythology. There is also a great resource which your area might have called a library. In fact, I’ll even take things one step further and give you this bit of information. As a resident of your state you CAN get free access to public college and university libraries and check out books there. If they don’t specifically have any neopagan or modern polytheist titles, look for religion books (BL especially if the library uses the Library of Congress classification system), but also check for history, mythology, and anthropology. You can also always hunt online for used copies of books, check sites like Paperback Swap, and ask friends to borrow their books. My library doesn’t have these books! If you’re really hard up for money, or looking for a specific title, ask your library about getting a title through Interlibrary loan. Incidentally, if you do this often, please seriously consider making a donation of money or time to your library. ILL costs a lot of money. I still can’t find the books! Well, there are still blogs to be read (like this one, the ones I liked in the sidebar, and a TON of blogs on all sides of paganisms. There are people who have written up free articles online. We’re also not a religion of the book, or books. Don’t forget to go out there and DO ritual. PRACTICE. Experience life. If you’re not sure what to do, may I suggest starting out by talking to your ancestors. If you’re still not convinced, turn the table and think how you would feel if you put months or years of work into a book, only to find out your works were being pirated online. EDIT: One of my fellow bloggers, Dver, did a really nice post about taking advantage of library resources to turn up information. This post is a part of the Pagan Blog Project. General books about paganism are about as common as anything now. Books relating to reconstruction and revival traditions are somewhat rare, but not impossible to find. Books giving a truly pagan perspective on andcient philosophy and how to bring that into modern life are truly rare. I can think of very few titles worth noting. Which is why, despite its being outside my usual traditions, Longing for Wisdom is certainly going to be a book to see much use from me. Several of the maxims include reflections and meditations one can contemplate when learning about a particular maxim. These exercises take these phrases away from the intellectual consideration and make them real to the practitioner. In order to fully internalize a new world view (or perhaps reinforce beliefs already present), this is the most direct action one can take on that path. The maxims certainly can apply to other pre-Christian cultures as well. Both my Kemetic and Heathen sides (which aren’t really in opposition) were nodding in agreement to many of the maxims presented and brought to some new ideas thanks to Szabo’s commetary. Through both her own academic and personal study, Szabo has done a fine job placing the maxims into a modern practice. This book can easily become a good reference as well as a source for inspiration and meditation. She herself states that you can either read the book straight through, or select a maxim at random and simply read that small chapter. If you’re of a contemplative or philosophical slant to your practices, you’d do well to pick up this book.